Antarctica • Honoring his mother and inspiring others, Daniel Burton went on the most challenging adventure of his life. 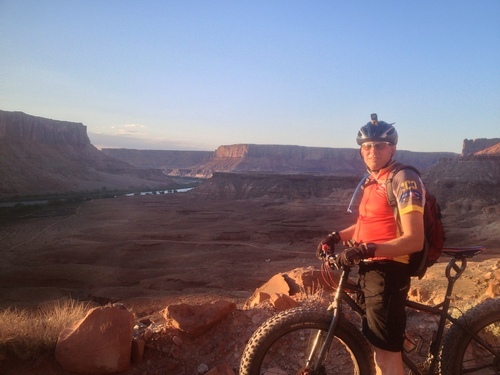 | Courtesy Burton family Daniel Burton of Saratoga Springs biking in Moab. The morning of Jan. 21, 2014, Burton finished the first-ever biking expedition from the Antarctic coast to the South Pole. | Courtesy Burton family Daniel Burton of Saratoga Springs biking across Utah Lake in January 2013. 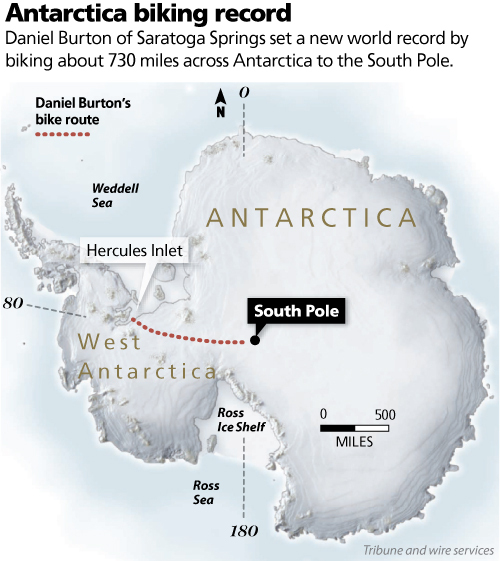 The morning of Jan. 21, 2014, Burton finished the first-ever biking expedition from the Antarctic coast to the South Pole. 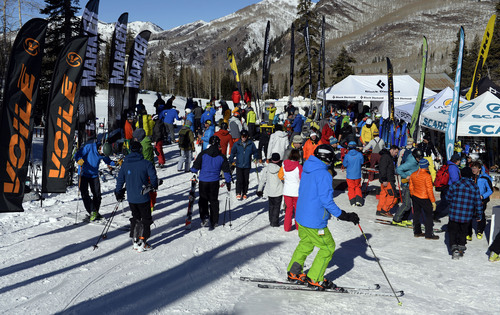 Francisco Kjolseth | The Salt Lake Tribune Companies open the annual Outdoor Retailer Winter Market Show by allowing folks to try their gear at demo day at Solitude Mountain Resort in Big Cottonwood Canyon on Tuesday, Jan. 21, 2014. 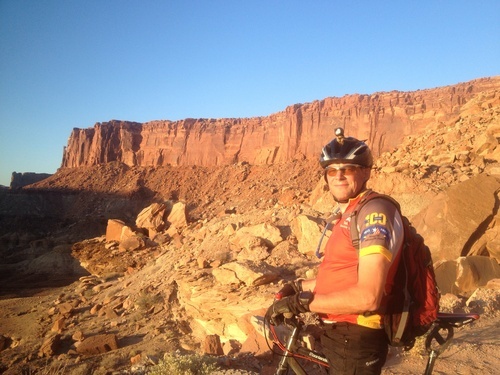 | Courtesy Burton family Daniel Burton of Saratoga Springs biking in Moab. The morning of Jan. 21, 2014, Burton finished the first ever biking expedition from the Antarctic coast to the South Pole. 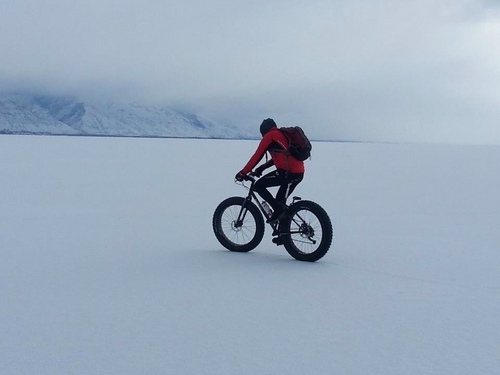 Utahn Daniel Burton on Tuesday became the first person to bike all the way from the coast of Antarctica to the South Pole. Helen Skelton, of England, set the first cycling record on the continent in 2012 when she biked part of the way to the pole  103 miles; she snow-kited and snowshoed the rest of the way, according to Men&apos;s Fitness Magazine. American Eric Larsen broke her record the same year with 335 miles on a bike during an unsuccessful attempt to reach the bottom of the world on only two wheels. So Burton finished what Larsen started. The Saratoga Springs man, who turned 50 during the trip, reached the South Pole on Tuesday after a grueling 50-day trek across the frozen wastes of the inhospitable continent. Burton set a new world record by traveling about 730 miles across Antarctica on a bike  which, ironically, is a Borealis brand, a Latin word meaning "northern." As Burton sees it, cycling saved him when his health had deteriorated. He wanted to make a difference with his new life and inspire others to turn their health around, so he put that life at risk on a continent of ice and death to do what had never been done. Born again on a banana seat • Though Burton had a healthy, active childhood, he slumped into a sedentary life as a computer programmer. Twenty-three years into his career, out of shape and new to his 40s, he went to get his blood checked. "My cholesterol numbers were real bad, my blood pressure was high, and I was a few pounds overweight. I panicked, thinking I might die early," Burton wrote on his blog, Epic South Pole, which he used to chronicle his expedition. So Burton got into mountain biking, restored his health, bought a bike shop in 2008 and finished the Lotoja Classic (a ride from Logan to Jackson, Wyo.) six times. It&apos;s the longest single-day race in the country that is sanctioned by USA Cycling. Then Burton was inspired to do more. His Antarctic ride is not only meant to inspire people and encourage donations to the American Diabetes Association, but he rides in honor of his mother as well. High cholesterol contributed to her death Nov. 30, 2012. So last fall, Burton left the bike shop in the care of his family, booked a trip to Hercules Inlet on the Antarctic west coast (fittingly sharing a name with the demi-god renowned for feats of strength) and, on Dec. 2, almost a year to the day after his mother&apos;s death, Burton started pedaling onto the ice shelf. Ahead of him: hundreds of miles of persistent winds, deadly crevasses, silent plains, steep mountains, dense fog and blinding snow. "Well, I guess it is time to try riding in the worst blizzard you can imagine," he wrote on his blog. Thinking about his friend&apos;s trip, Ronald Tolley recalled what Gandalf tells Bilbo before they embark on their dangerous quest in "The Hobbit": If he does come back, he will never be the same. The bottom of the world • Antarctica seems otherworldly: a windy continent buried under a mile of ice and  at this time of year  basked in eternal sunlight. It&apos;s the middle of summer there now, and the highs are still below freezing. Expedition organizers set up a few caches of freeze-dried food for Burton along the way, but he would have to melt snow for water. While he would occasionally catch a brief sight of another traveler in the distance, no one would be there to meet him; until he was done, he was alone. After 11 days, he was so exhausted that he lost his balance and fell over several times. For a familiar frame of reference, Burton compared a long, hard day of biking to the pole to pedaling to the top of the Y sign on the mountain above Provo for five straight hours, taking a break, then doing it again for another five hours. Imagine that, plus freezing temperatures, blinding fogs and blizzards and the constant risk of falling into a gaping crevasse, while dragging two sleds of supplies behind you. "My grandmother would see a beautiful sunset and say it was the most beautiful she had ever seen, and she meant it. So when I say that each day was the hardest of my life, it is in honor of her, because it really is the hardest day of my life every day of this expedition," Burton wrote Dec. 19. He surpassed Larsen&apos;s record about the same day. Burton brought his iPod so that the likes of Rihanna, P!nk and Green Day could keep him company. Plus, he can listen to scripture on Sundays (Burton is Mormon). But there was at least one pitfall to the music: "When you are dead tired and don&apos;t want to go on anymore, it is not a good time for Pink Floyd&apos;s &apos;Goodbye Cruel World&apos; to come up on the playlist," Burton wrote on his blog. Burton also brought a satellite phone that he used once a day to call his family, update his blog and touch base with the expedition organizers. The phone allowed him to call his daughter on Christmas, the first he had ever spent away from home. "It was great to be able to hear her voice," he wrote. The day after Christmas, Burton saw the first person that he had seen in what seemed like forever  a truck heading back from its trip to the pole. "They waved as they flew past … then a [fog] moved in and I lost the ability to see anything." On his last leg • On Dec. 28, he began the last of three major legs of the expedition. Ahead of him lay another steep climb up 4,500 feet of elevation. The weight of his supply sleds had "killed" him in the first days of the expedition, when he had to climb other steep slopes. "If [this] next section goes as bad as the first," he wrote, "I will never make it." So Burton ditched all the extra weight he could: his brakes, the water bottle cages, the racks, the side bags, charging wires and other electronics. He weaved around and over enormous wavelike ridges of snow called sastrugi, which you find only on the polar plains. While they look spectacular, "when you bike over them, you can&apos;t see, it&apos;s very scary and treacherous," Burton wrote. "You&apos;ll be going along and all of a sudden you&apos;ll have a [4-foot] drop that you didn&apos;t even see coming, which is very painful, even if you don&apos;t crash." The morning of Jan. 8, Burton found a cache, a late Christmas card and holiday treats. "I think being alone for so long is messing with my emotions. I was overcome with joy at getting those." During the last leg, Burton felt "so ready to be done." But he kept his spirits up, making sure to enjoy the ride. "We only get to live each day once," he wrote, "so enjoy where you are." In his final days of the expedition, gales blowing out of the south slowed him down to a crawl. "Everything is so cold that if I touch things with my hands, I get instant frostbite," Burton wrote. On the upside, "with the strong winds and blowing snow, navigation was easy  head straight into the blowing wind." On Jan. 21, about 10 a.m. Mountain Standard Time, he made it. Home again • There is an actual candy-cane-striped pole marking the spot. He was as far from the North Pole as he could be, but it may have felt a lot like Christmas. Burton wants to celebrate the much-belated yuletide holiday when he gets home. His wife and teenage son left the tree up for him all these weeks. Right behind the ceremonial stick in the ground is the research station that Americans have occupied since 1956. At this time of year, about 150 people work at the facility which is about 150 more than Burton had seen in a long time. "When I saw it, I was so overcome with joy! I called home to my wife and lost all control of my emotions," Burton wrote in his triumphant blog entry. "The black dots on the horizon were the most wonderful thing I have ever seen." Burton&apos;s family said they were never all that worried about him. He was in good hands with the expedition&apos;s organizers, the Salt Lake City-based Adventure Network International, who would have triggered a search-and-rescue if he failed to call each day. His daily calls to his family kept them reassured, too. Media Burton thought her husband was joking when he first mentioned biking to the South Pole, inspired by Larsen&apos;s attempt. She said it&apos;s amazing what he has accomplished while competing against professionals, "being just an average guy off the streets who was a computer programmer a few years ago." When he returns  he is being flown back to the coast in a ski plane  Burton wants to start a foundation to get teens into cycling. The teens would receive a mountain bike, and if they complete the program by riding a certain number of times, they get to keep the ride. Burton has set up a GoFundMe page to raise $50,000 to back the new endeavour. Daniel Burton&apos;s 730-mile journey had three main legs: the first was the steep climb inland and upward from Hercules Inlet, the coast. The middle stretch was easier, flattening out from Patriot Hills to the Thiels mountains. The last leg was a long, hard climb to the pole, which lies about 9,300 feet above sea level. The original plan was to bike back, but he opted instead to fly.